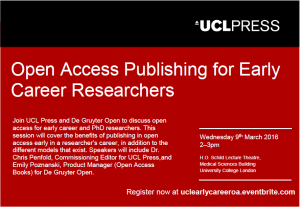 Join UCL Press and De Gruyter Open to discuss open access for early career and PhD researchers. This session will cover the benefits of publishing in open access early in a researcher’s career, in addition to the different models that exist. Speakers will include Dr. Chris Penfold, Commissioning Editor for UCL Press, and Emily Poznanski, Product Manager (Open Access Books) for De Gruyter Open. 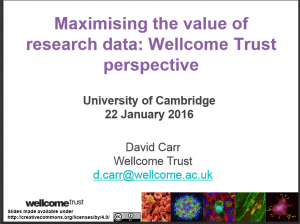 I intend to apply for a Wellcome Trust or CRUK grant, what should I know about data sharing? 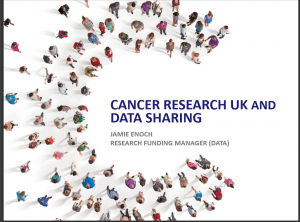 All Wellcome Trust and Cancer Research UK grant holders like grant applicants should be aware of the charities’ research data policies. To clarify their requirements, our colleagues at the University of Cambridge have asked them questions related to data management and data sharing. answers to questions asked by researchers on access to data, quality control, conditions and costs of sharing, metadata standards and policy implementation.